Author: Pius W. Akumbu, Evelyn Fogwe Chibaka. Series edited by: Wilhelm J.G. Möhlig, Bernd Heine. 16 pp. Roman, 209 pp. 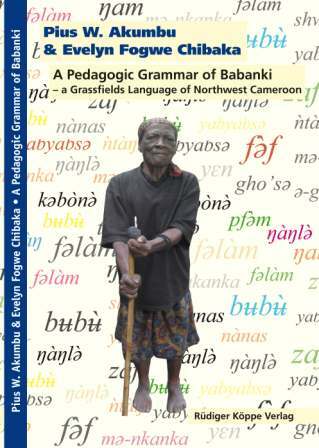 This book contains a description of the grammatical system of Babanki, a Centre Ring Grassfields Bantu language spoken in the Northwest Region of Cameroon. The Babanki language is spoken in two villages, namely Kejom Keku (Big Babanki) and Kejom Ketinguh (Babanki Tungo), located 20 km apart. The dialects spoken in these two villages have a few differences in sounds that do not perturb mutual intelligibility, however. Both villages have a heterogeneous population of about 25,000 people (Akumbu, 2008). The first chapter introduces the work by providing relevant back­ground information on the language and study, followed by the presentation of the sound system in chapter 2. The third chapter focuses on the internal constituency of Babanki nouns by pre­senting the different noun classes and discussing the concord system triggered by the noun affixes. The following two chapters describe the pronoun system and noun phrases, simple as well as complex ones. Chapter 6 presents the structure of the verb and then the different verb classes before moving on to discuss verbal reduplication which involves the verb stem. Furthermore the grammatical system of tense, aspect and mood followed by the description of question formation is presented. First affirmative/negative response questions and content questions are discussed before other question types are considered. Chapter 9 focuses on the formation and use of ad­verbs closely linked to the formation and use of prepositions. Finally chapter 10 discusses three grammatical classes, namely, coordinators, complementizers, and the copula, and two phenom­ena – ideophones, and serial verb constructions to complete the study. In addition to preserving the language and by extension the culture of the people, the main pur­pose of the description is to facilitate the learning of this essential tool of communication. Pius Akumbu and Evelyn Chibaka are to be commended for their descriptive grammar of Babanki, a Center Ring language of Grassfields Bantu. [...] They provide a study that addresses the interests of both linguists as well as educators. They have walked a fine line between a linguistically informed presentation and one they can feed into the development of relevant curriculum for speakers of Babanki, and have done well. Thus, their study has the potential of impacting our knowledge of Grassfields Bantu languages and the education of the youth of the Babanki community. I trust it will serve as a model for many more such grammars of African languges.